The JW Marriott Marquis Dubai has marked its opening by being awarded the title of the world’s tallest hotel from the Guinness Book of World Records. The 72-story property in Dubai is the first JW Marriott Marquis hotel outside North America and the 59th property in the brand’s global luxury-hotel portfolio. Reaching 355 meters (1,164 feet) in height, the JW Marriott Marquis Dubai is 26 meters (85.3 feet) shorter than New York City’s Empire State Building. 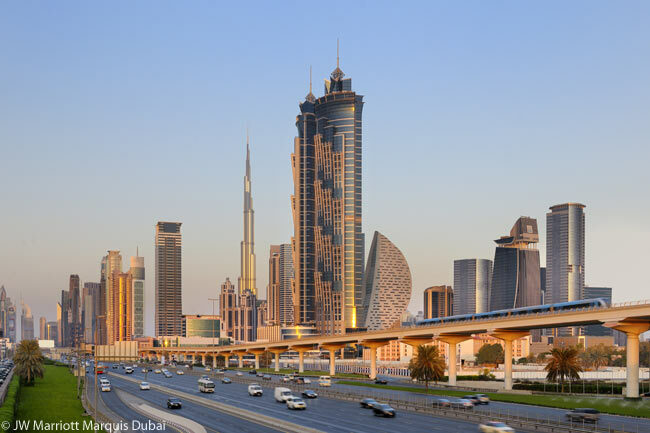 In Dubai, the hotel’s towers have already become a familiar sight on the city’s skyline. “Dubai is an important destination for Marriott International as one of the world’s most exciting cities offering world-class facilities and infrastructure, central location in the region and future growth potential,” said Arne Sorenson, president and CEO of Marriott International. In addition to serving luxury business travelers, the hotel, which is owned by Emirates Group, targets the increasingly important MICE (meetings, incentives, conferences and exhibitions) market by filling a long-identified gap in the region, according to Marriott International. Groups, meetings and conventions of up to 1,000 people can now meet, stay and dine, under one roof. The hotel is the first in Dubai able to accommodate large groups and will play a key role in attracting major conventions and events to the destination. 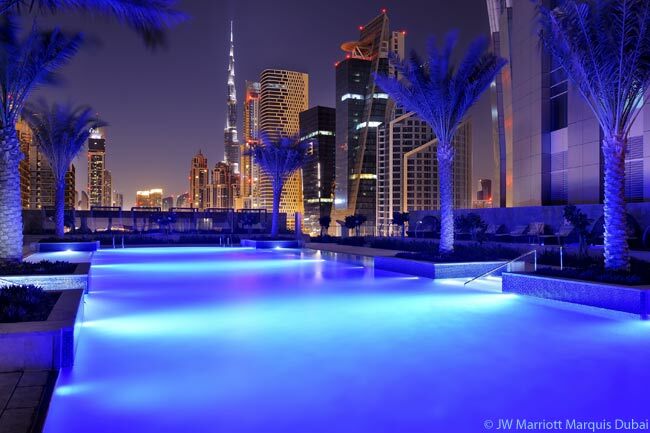 Along with modern business facilities, the JW Marriott Marquis Dubai features more than 7,500 square meters (80,730 square feet) of indoor and outdoor event space, including two ballrooms, and a large selection of dining and entertainment options. 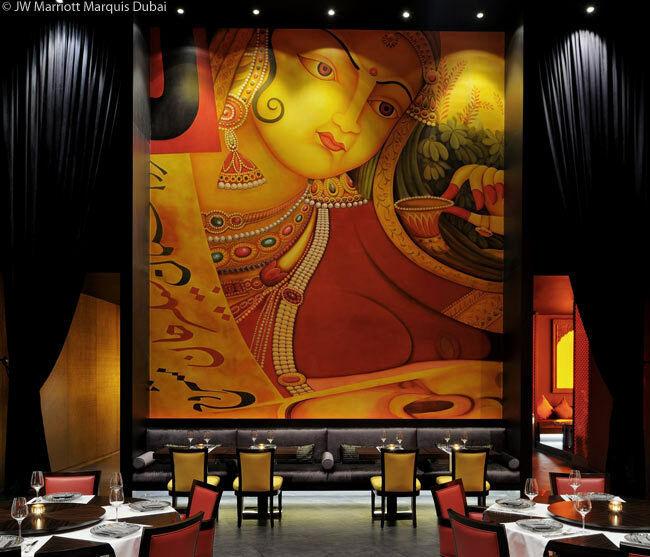 The JW Marriott Marquis Dubai offers nine restaurants, and five bars and lounges, including the sky-high steakhouse Prime 68; the experiential sushi restaurant, Izakaya; and the cocktail bar Vault, which is situated on the 71st and 72nd floors and features panoramic views of the city. The hotel is also home to Rang Mahal by Atul Kochhar, the first Indian chef to be awarded a Michelin Star. A 4,000 square-meter (43,050 square-foot) Saray Spa and Health Club in the hotel draws inspiration from the caravanserai silk route across Arabia. Treatments include a Milk and Honey treatment, an Arabic Coffee Awakener, and Lemon Mint Body Polish. A pool deck covers the 7th floor of the hotel and boasts a 30-meter (98-foot) swimming pool. Aqua Poolside Bar and Grill draws inspiration from Miami’s South Beach, offering light snacks and beverages throughout the day. 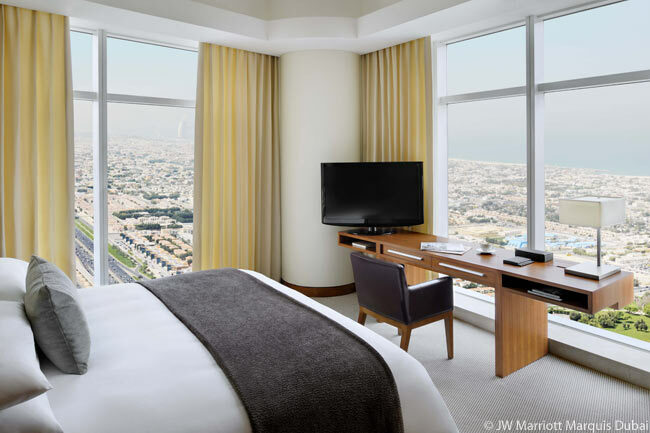 For more information about the JW Marriott Marquis Hotel Dubai or to make a reservation, visit www.marriott.com, or contact the hotel directly on +9714 414 0000, via email at jwmarquis.dubai@marriott.com or online at www.jwmarriottmarquisdubai.com. Currently, there are 59 JW Marriott hotels in 23 countries; by 2015 the portfolio is expected to encompass 79 properties in 28 countries. To find hotel deals in Dubai, click here.